To purchase any MCAT Online Course including MCAT Organic Chemistry review, click on "Courses" above. 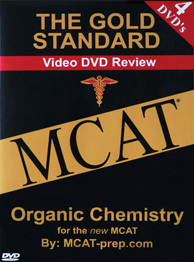 Below you can purchase MCAT Organic Chemistry video DVDs securely by credit card or PayPal. 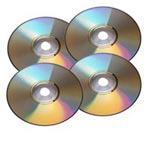 These MCAT Organic Chemistry Video DVDs described below with lecture-style science review can be played on a regular DVD player, PC (min. of Pentium 200 MHz) or Apple computer (min. Mac OS X - Panther). Ready for the current all new Computer Based MCAT CBT, the price is $99 for all 4 MCAT Organic Chemistry Video DVDs, only $5 for Shipping and Handling (continental US and Canada). These videos are also useful for the PCAT, DAT Test, OAT, premed or introductory level (first year) college or university "Orgo". Teacher`s biography: Dr. Brett Ferdinand has written the #1 text fully updated for the MCAT: The Gold Standard MCAT published by RuveneCo. He also wrote The Silver Bullet: Real MCATs Explained. He is a medical doctor with extensive knowledge of this test because he aced the exam, he teaches undergraduate students and he has written about the Medical College Admission Test for 10 years. Dr. Ferdinand teaches MCAT Organic Chemistry on these Video DVDs. *MCAT is a registered trademark of the Association of American Medical Colleges, which does not endorse this study guide or our methodology. These videos are also useful for the PCAT, DAT Test, OAT, premed or introductory level (first year) college or university "Orgo".